Ergo...my musings by Vivian: My Latest Compulsion ~ Baking No Knead Free Form Artisan Bread! 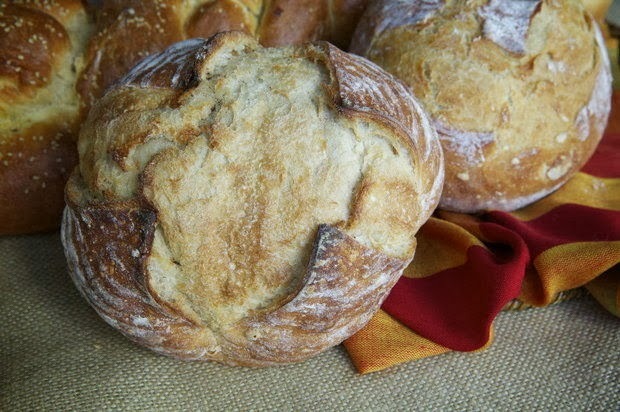 My Latest Compulsion ~ Baking No Knead Free Form Artisan Bread! Few to zero people have ever accused me of being a domestic goddess ~ a goddess maybe, but, despite my being born a Cancer (according to what could be a flawed Zodiac) I have little interest in the domestic arts. And I tend to be a dilettante in whatever endeavor calls to me at any given time. So, at this moment in 2014 I have plunged fully into baking bread – the easy way. Thanks to the experimentation of Dr. Jeff Hertzberg and his wife Zoe François, and their book Artisan Bread in Five Minutes a Day [not to mention the patient tutoring by my devoted domestic god, Todd] I have successfully baked bread that is not just edible, but delicious and easy. I love bread. I still dream of a particular walnut wheat bread that was baked by the chefs at the Marriot Hotel in Hong Kong in 1992. Perhaps it is my Catholic upbringing, but with a multi vitamin I’m fairly certain I could survive on a diet of bread and wine. 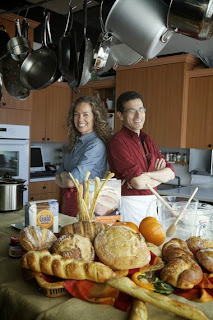 And, according to the description on their website of the latest book titled: The New Artisan Bread in Five Minutes a Day: the Discovery that Revolutionizes Home Baking, [which Amazon.com dispatched to me] includes gluten free five minute recipes! Try it! If I can do it, you can!